One of the magnets at the Hillarys Boat Show was the Seacat 636. A power cat is the boat every fisherman is going to buy one day, and this one was more affordable than most as well as very much looking the part. It is the big brother to some very successful cats imported from South Africa. 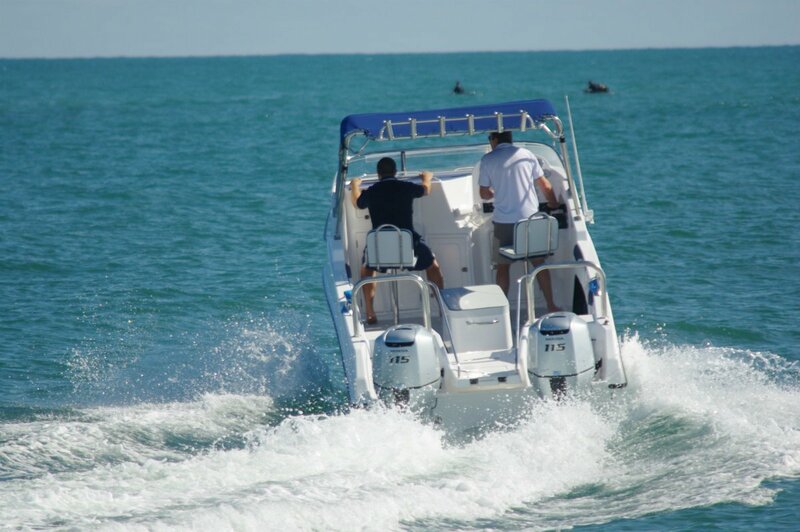 The 636 is available as a centre console, but the review boat was forward control or runabout style, offering very good shelter to the driving position and leaving abundant room for fishing. 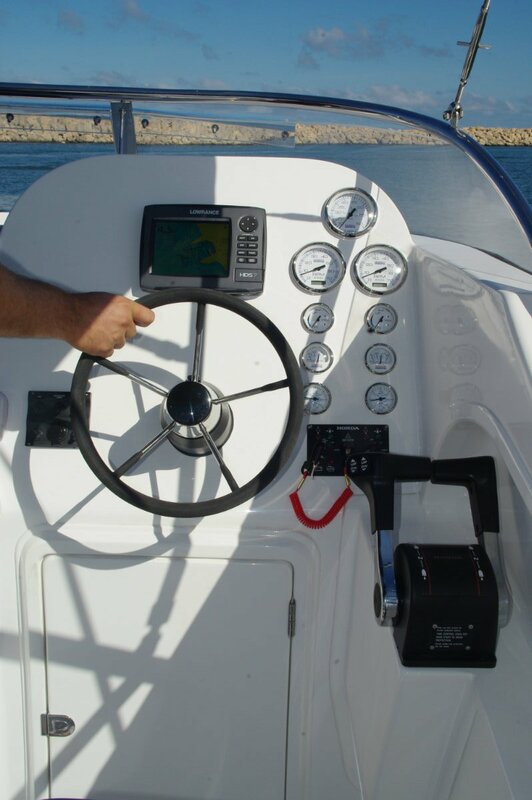 This is a boat for active sports, and the cockpit can be adjusted or totally stripped to give room in the right places. The secondary seating is provided by an upholstered box locker normally positioned mid cockpit. You can choose to leave it at home or move it elsewhere in the cockpit. You can even buy another one for family days. A 6.4m overall length and a beam of 2.5m sounds like a roomy enough boat, but the reality is extremely roomy – the catamaran difference. Another difference is in the stability, only when they are aground are monohulls this steady. Room and stability: basic ingredients for good fishing boats. Other fishing goodies include rocket launchers, horizontal rod racks in carpeted recesses in the bulwarks, conveniently located drink holders, a clear fronted bait tank and a stack of tackle drawers in the forward bulkhead. That bulkhead closes off a space under the foredeck intended for stowage of bulky stuff, but it is big enough for a couple of mattresses for the occasional overnight. There is also room, and headroom, in there for a toilet, and a clear fore hatch gives daylight. The driving and navigating seats are simple swivels, but their protection got a lot of attention. The windscreen has wind deflectors on top, and the Bimini above has the benefit of some classy metalwork. The folding Targa it attaches to is beefy and well up to the job of secure handhold, and the Bimini’s framework is tensioned to the windscreen by magnificently over-engineered stainless bottlescrews. The deflectors really worked and only wimps would want to insert clears between screen and Bimini. 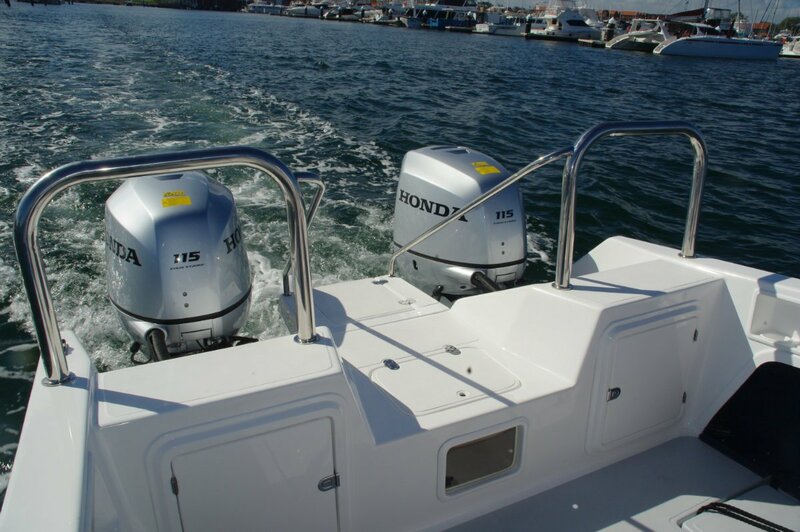 We gave the deflectors a workout with the wind created by our full throttle progress from the twin 115hp Hondas. 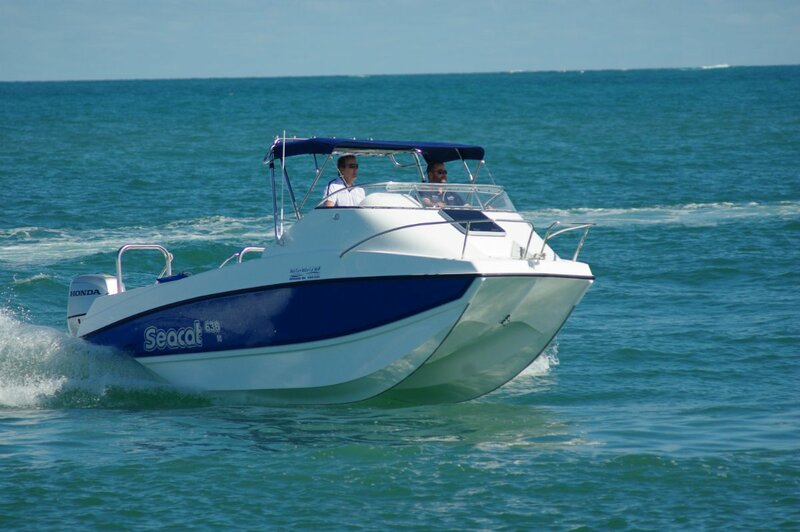 The Seacat was well able to use this power but, by dropping to 90s and still getting good performance, the price reduces from $96,900 to $88,900. Throttle control is by cable, but either some magic from Honda or exceptional installation by the agents made the effort needed more like that for an electronic system. It was part of an all-good under way impression. Tracking, ride, hull quietness and dryness were all to a high standard. This is the biggest boat I have been on in recent decades to use portable fuel tanks. 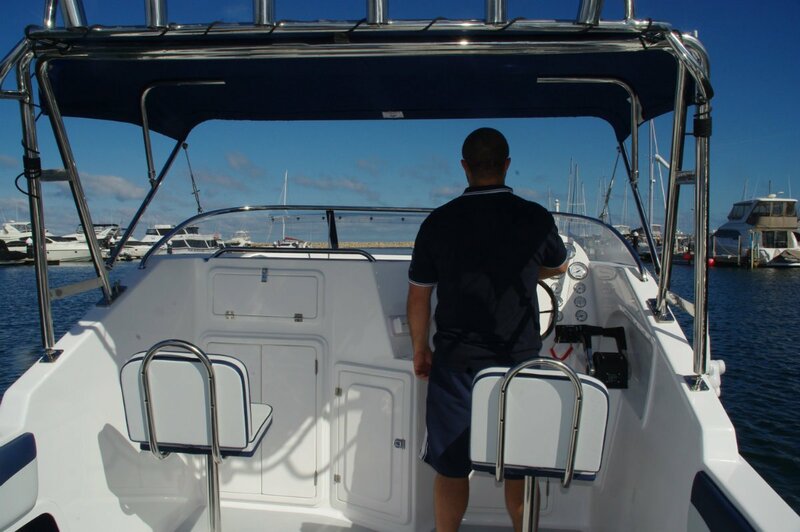 All the boats in the Seacat range use this system, and it has the advantage of simplicity without the inconvenience of a deck full of tanks. In standard form the 636 has tanks holding 160 litres located below deck in tailor made lockers. To special order this can be increased to 280 litres. That deck is self draining, but the padded coamings hit the thighs as high as if it were below sea level. The self draining arrangements are typically clever: rubber balls sit in cages below the draining ports and rise to block the ports if a sea tries to force its way aboard. The Seacat was designed to be launched from a surf beach. To suit that it has a rugged structure, wear strips along the keels and crash bars over the motors. It also has an extra heavy duty trailer rigged for beach launch and recovery. 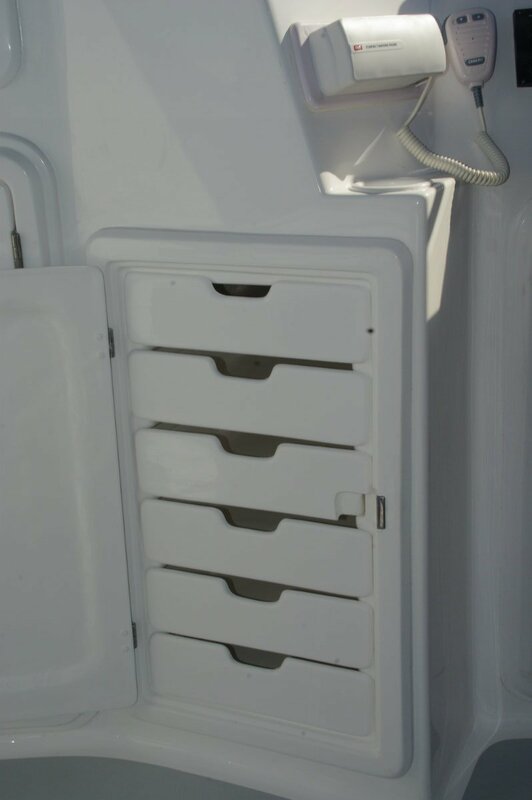 The break back pivot is placed to give an unusually steep drop or climb for the boat, and to accommodate the latter it has a gadget I had never seen before. The winch wire can be led over an extra sheave mounted on a post to make the pull parallel with the broken back. Once the boat’s weight has straightened the back you take the wire off the sheave and pull in the usual way. Ingenious.